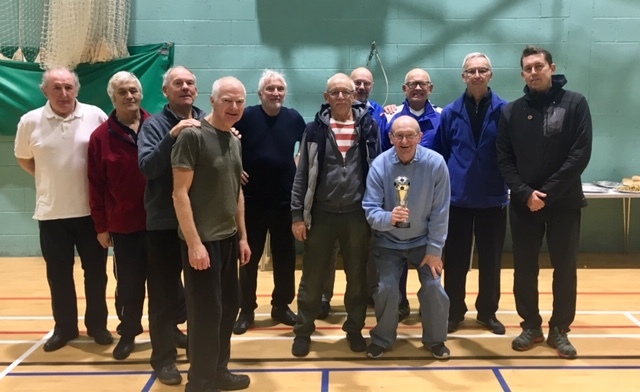 The second Manchester Walking Football Over 70s Cup Tournament was played at the Heywood Sports Village on Thursday 8th November 2018. It was played with the usual Autumn mixture of rain and a cold wind to test the players involved. Some very skilful ageing footballers were on show. With the younger generation showing less and less interest in traditional amateur league football, these guys cannot get enough of bringing back their youth in a sport they still love. Long may it and themselves last. Six teams took part in this Manchester Walking Football Over 70s Cup Tournament, AFC Blackpool Senior Seasiders, Bury Relics, Preston North End Senior Whites, Rochdale AFC Strollers, Wakefield Wanderers, and Wigan Walkers. AFC Blackpool Senior Seasiders Winners GMWF Over 70’s Cup Tournament 08.11.18. Rochdale AFC Strollers Runners Up GMWF Over 70’s Cup Tournament 08.11.18. Pat Fitzgerald Of Bury Relics Who Won The Fair Play Award Receives A Bottle Of Wine From Paul Gardner. 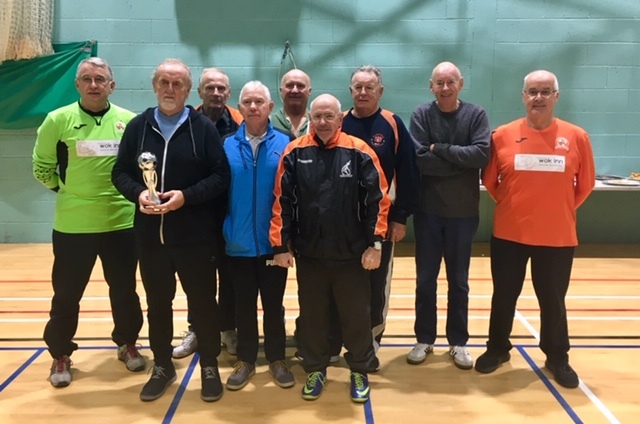 After a round robin series of matches which saw all the teams play each other it was congratulations to AFC Blackpool Senior Seasiders the Manchester Walking Football Over 70s Cup Tournament winners. Rochdale AFC Strollers were runners up. Congratulations to all the teams who took part in what was a very successful day of walking football for the older players. As expected, physicality was at a minimum and running was generally limited to a few offences. It seems the older the competitor, the more sensible they become. 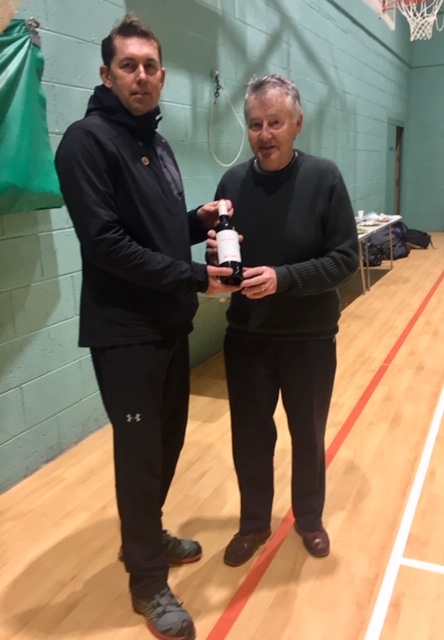 The referees choice for the fair play award went to Pat Fitzgerald from Bury Relics, well done to Pat who is pictured receiving a bottle of wine from Paul Gardner. As usual many thanks to our excellent referees, Alan Graham, Garry Pearce and Mike Willmore for making this tournament a success. One factor destined to make any tournament a failure is poor refereeing and I think most would agree we have some top class officials in the Greater Manchester Walking Football League. A special thanks to Steve Colesby for arranging the fixtures and score sheet for the event and to Bill Murney for all his hard work communicating with teams before the day’s event. He was missed on the day but we look forward to his return next week. Thanks also to Matt Howells, who stepped into the shoes of Barry Woodburn to sort registration and collect the scores on the day. Without the input of people like these we couldn’t hope to make the day a success. Comments welcome below. We also have a Facebook page, please visit and give us a like. Always look fwd to playing at Heywood, well organised and intelligent refs using common sense. I’ve played in the three age groups and I think everyone agrees, the older the group the more enjoyable. I think we realise it takes longer for us relics to recover from injury. How refreshing to participate in a tournament that was played in the true spirit of the game. The quality of refereeing was second to none and players of all the teams naturally respected that. I have to say that I was filled with pride to be part of such a good team, not to mention a great set of ‘lads’. Many thanks to the organisers for such an enjoyable day. Once a Senior Seasider, always a Senior Seasider. Well done to the organisers for making it a really enjoyable day. The match format was great as there was no waiting about between matches and the referees were excellent as usual. I never thought that I’d be buying shin pads and playing competitively in my 70’s. Thanks to all the participants who competed in the right spirit. Another excellent day of “competitive” football played in the right spirit between a great set of “gentlemen”. All down to the strict refereeing and fair play by all the sides. Nice that the Very Senior Seasiders can show our younger colleagues back on the coast how to bring back a trophy. Thanks to all the teams taking part. A brilliant day. Also thanks to Paul and the staff at Life4Link for a great spread afterwards. Many thanks from the lads at Wakefield for the chance to play. We only had 6 men and gather they performed well throughout – they were all cream crackered and certainly must have slept well on Thursday night. Thanks to Paul, Bill and Matt, the referees and all who stood in to help organise and run the day. 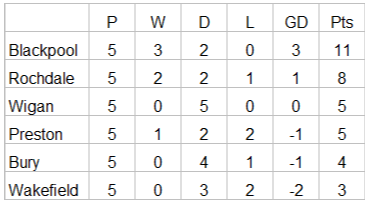 Well done lads, no goals conceded can’t be bettered. The way my 60’s are struggling, maybe I should take the 70’s team with me on December 6th for the last fixtures and save us from relegation. 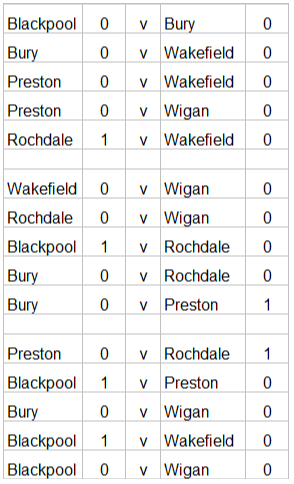 Brilliant, congratulations Blackpool and to all the players who took part. Playing in the over 60’s GMWF League has really put something that was missing for over 15 years back and providing I stay healthy there a future in the game for myself and hundreds of other players. As normal a big thanks to the refs and the organisers of this and all the other GMWF League tournaments and congratulations to all who took part yesterday.